The mission of Annals of Surgical Oncology is to: 1) disseminate high quality clinical and translational cancer research, review, and expert opinion/ commentary articles; 2) represent and advance the profession of Surgical Oncology throughout the world; 3) promote high quality multidisciplinary patient care worldwide; 4) improve global cancer surgery education and training; 5) promote diversity in all of its endeavors. A leading peer-reviewed journal in Oncology and Surgery, ASO features original articles on the latest advances in oncology for cancer surgeons from all specialties. The journal promotes clinical and translational cancer research, with an emphasis on clinical trials. ASO also supports the career development of surgical trainees and their transition into academic and community-based practice and publishes timely articles about healthcare and global research issues and policies related to the surgical patient with cancer. ASO promotes diversity in all of its endeavors. Leading subject areas of ASO include Gastrointestinal Oncology, Breast Oncology, Hepatobiliary Tumors, Colorectal Cancer, Thoracic Oncology, and Translational Research. Led by world-renown and expert surgical oncology editors, these subject areas as well others are well-represented by articles that are cutting-edge and frequently cited. Editorials in ASO place new and sometimes controversial research into perspective, and review articles provide comprehensive yet succinct overviews on complex topics of concern to practicing surgeons. The journal also publishes video manuscripts that demonstrate state-of-the-art surgical techniques as well as dynamic articles that use a range of media to educate on important surgical oncology topics. 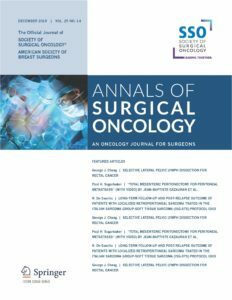 ASO is the journal of choice of surgical oncologists and cancer multidisciplinary teams worldwide regarding surgical oncology research and education, and benefits surgeons, oncologists, hematologists, radiologists, general practitioners, pathologists, researchers, academicians, and other clinical professionals interested in all aspects of the surgical treatment of cancer. ASO strives to improve the practice environment in which high-quality surgical oncology care is delivered, to enhance the quality of life and survival of the surgical patient with cancer. and his fellowship in Surgical Oncology at the University of Texas MD Anderson Cancer Center in Houston. In 2018, the Annals of Surgical Oncology celebrated 25-years of supporting research and educational needs of cancer surgeons. The infographic below presents interesting facts and figures. Inquiries for print or digital advertising opportunities may be directed to Georgia Nikolaros.